San Antonio sure knows how to throw a party. 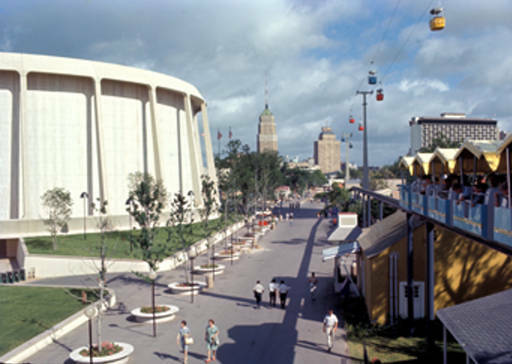 In 1968 , to celebrate its 250th birthday, a world's fair, called HemisFair '68, opened on April 6, 1968. With so many exhibits to see and foods to sample, a visit was a treat for the soul and the palate. I was lucky to live in San Antonio and watch HemisFair taking shape. The fairground was located in the downtown area, just a few blocks south of the Alamo. It was especially exciting to watch the Tower of the Americas rise up into the South Texas sky. From the bottom to the top, it measured 750 feet tall. The tower had two restaurants at the 550-foot level. One served what was called "gourmet" food – with prices to match. It was worth it for the incredible view. The restaurant made one complete rotation every hour and, as the song goes, "On a clear day, you can see forever." Many foreign countries had pavilions that showcased the best from their part of the world. Big companies such as IBM, Ford Motor Company, Coca-Cola, and General Electric hosted exhibits. Frito Lay/Pepsi Cola presented the most popular attraction, Los Voladores de Papantla – better-known as the "Flying Indians." This group from Vera Cruz climbed to the top of a 114-foot pole and, with ropes tied around their waists, would leap off and make 32 turns around the pole. Anyone who saw them will always remember their breathtaking performances. When you got hungry, there were lots of options. Two large food areas (the Goliad Food Patio and the Tower Food Patio) offered an amazing array of choices, from chorizo to Quiche Lorraine, and Sloppy Joes to French crêpes. The lower level of the Lake Pavilion (near the tower) was the place for carnival fare (cotton candy, chili dogs, snocones, etc.). On a family visit, I saw a sign for Belgian waffles, and asked if I could have one. Unfortunately, we were leaving, and I was promised that I could buy one next time. I never did get to sample one, but I've included a recipe later. Besides the two tower restaurants, there were many separate eating establishments scattered across the fairgrounds. To name a few: the Bavarian Beer Garden, Old Frontier Steak House, the Sir John Falstaff, Crêperies Parisiennes, and the Polynesian Gardens. Preheat your waffle iron (for genuine Belgian waffles, you'll need a waffle iron specifically for Belgian waffles.). In a large bowl, stir together the flour, baking powder, baking soda, salt, and sugar. Make a well in the center and add the buttermilk, milk, eggs, and melted butter. Mix together just until moistened (don't over mix – there should be plenty of lumps in the batter). Spray the waffle iron with the nonstick vegetable spray. Put 1/4 cup of batter onto the grids (or the amount recommended in your waffle iron's instruction book), and bake as directed. Remove cooked waffles to serving plates. Dust with confectioners' sugar and top with berries and whipped cream. To be really decadent, add a scoop of ice cream. Makes 8 waffles. Whipped cream: In a chilled bowl, whip 1 cup heavy cream until slightly thickened, for about 2 minutes. Add 1 tablespoon confectioners' sugar and 1 teaspoon vanilla extract. Whip to soft, fluffy peaks. One of the "exotic" dishes served at the Casa San Miguel restaurant at HemisFair. Heat olive oil in wok or deep skillet and cook onion and garlic over medium heat until soft. Add shrimp and stir-fry until just opaque. Add pork, ham, and chicken. Stir-fry for 3 minutes, then add carrot, bamboo shoots or water chestnuts, and bean sprouts. Stir-fry for 3 more minutes and add cabbage, sprinkling with salt and pepper. Continue cooking, stirring frequently, until cabbage is tender but still crisp. Season to taste with more salt (or soy sauce) and pepper. Drain off excess liquid and set aside to cool. Place a spoonful of cooled stuffing mixture on spring roll or egg roll wrapper about 2/3 of the way up. Tuck in sides and roll tightly from top. Wet last edge to seal. If you want crisp-fried lumpia, heat canola oil in skillet until shimmering and fry rolls until crisp. Remove fried rolls with a slotted spoon and place on paper towels to drain off excess oil. To serve, place a roll on a lettuce leaf, fold two edges in, then roll to enclose lumpia. Serve with dipping sauce (directions follow). Makes about 2 dozen rolls. To make sauce: Place stock, soy sauce, sugar, and cornstarch in small saucepan. Simmer, stirring constantly, until thickened. Salt to taste and pour into a serving bowl (or individual bowls) and sprinkle with garlic. Scoop 8 balls of ice cream and place 1/2-inch apart on cake pans. Freeze for 3 hours, or until ice cream is frozen solid. Combine corn flakes and cinnamon in large resealable plastic bag. Seal bag. Using rolling pin, crush corn flakes into crumbs. Transfer crumb mixture to large bowl. Removing one ice cream ball at a time from freezer, roll ice cream balls in crumb mixture, pressing crumbs onto ice cream to coat completely. Refreeze ice cream balls until frozen solid. Beat eggs in medium bowl to blend. Working with one ice cream ball at a time, dip balls into egg, turning to coat, then roll balls in crumb mixture, pressing crumbs to coat ice cream balls again. Return ice cream balls to freezer until ready to fry. Add enough oil to large deep saucepan to come halfway up sides of pan. Heat oil over medium-high heat to about 300°F. Using fryer basket or slotted spoon, add two ice cream balls to hot oil. Fry for one minute, or until coating is crisp. Using slotted spoon, remove ice cream balls from oil and place on paper towels to drain excess oil. Fry remaining ice cream balls. Transfer ice cream balls to dessert dish or cup. Drizzle with one tablespoon of honey and dollop with whipped topping. Serve immediately. For those of us who were lucky enough to visit HemisFair '68, the memories will last forever. If you missed out, drop by HemisFair Park on your next trip to San Antonio – the Tower of the Americas and the Institute of Texan Cultures museum are still going strong and are well worth a visit. Visit the following websites for more: www.toweroftheamericas.com and www.texancultures.utsa.edu.